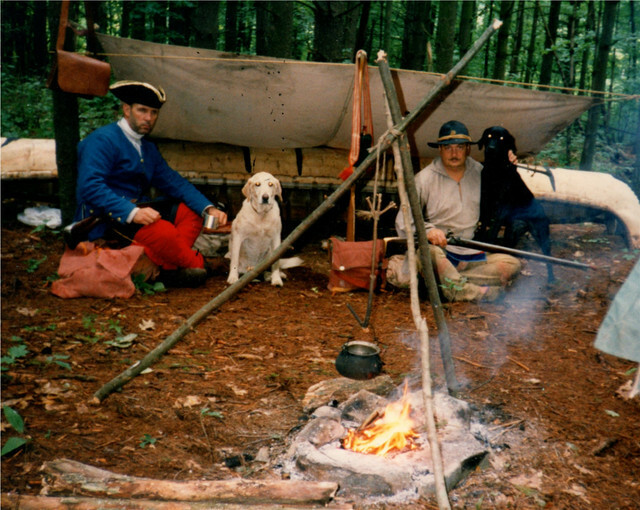 Has anyone here made oil cloth tarps for shelters or ground cloth? Linseed oil. Paint was also used. If you use linseed oil, hang it outside during the summer until it is completely dry, and I mean completely. If you touch it and there is any hint of oil on your hands it ain't dry or safe yet. Use sheeting weight cloth unless you like it heavy. There are vendors out there that can supply waxed cotton (Think Barbour coats) which is light and may suit your needs. Toward the end of my trek career I got fanatical about saving weight, and always justified dense weave cotton because in The Newbury Parish there was a Cotton Mill in the 1740's . I preferred not painting it because I judged it added weight. I conceded to Thompsons, which was the best at the time and you could judge how dry it was when the smell left after about a whole day in the sun. Pretty sure what we used to do was load it and an entire can into a plastic garbage bag and kick it around for two or three days before hanging it to dry. 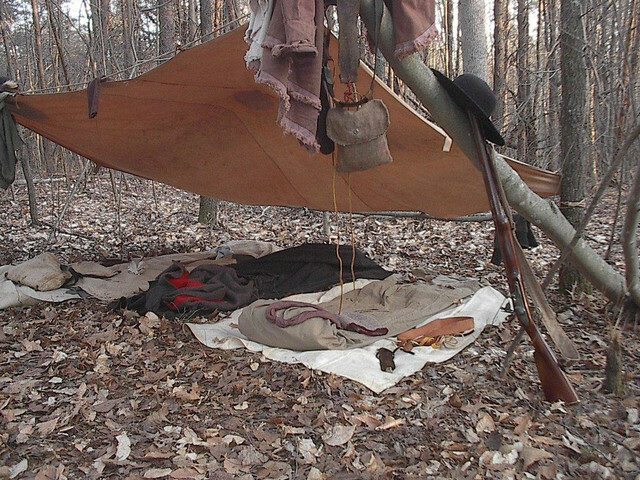 When interested in Rendezvous fell off and I sold everything, I kept my shoemaking tools, a couple of lasts, my personal gear, two guns and two cloths. Even the light canvas ( cotton) one I kept was built to be a lighter grade, and I believe it is this one, which did well on canoe trips. Back when I was trekking, I experimented with waterproofing for my bedroll bag and a tarp for a shelter or groundcloth. I, too, settled on Thompson's for the same reasons. It worked, dried fast, and the smell went away quickly. My tarp was about 10x10 and started out as a cotton paint drop cloth. I dyed the cloth brown, but it faded to a lighter color with use. It never leaked and I still use it from time to time when setting up for demonstrations or the occasional camp out. I really miss trekking. I would love to have a go at it now, but all my rowdy friends had settled in now. I was able to find this picture. I think this was my last group trek. My oil cloth got traded away years ago. But I have no doubt it is still going strong somewhere if it hasn’t been burned, or left wet to mildew. It was linen, made from a banquet tablecloth from the thrift store. I cut the tablecloth in half, because it was too long, and narrow. I then sewed it back together along the ridge line using a double seam. I treated it with a mixture of linseed oil, with a little beeswax melted into it, and some masonry colorant powder, for color, and increased waterproofing. I hung it in the shade during the summer to dry. An earlier cotton attempt burned up from spontaneous combustion, so I would not hang it in the direct sun, if you use linseed oil on it. Linen is much more tolerant of direct sunlight than cotton which will lose it strength over time. You might want to give up any idea of making your own. Museum Of The Fur Trade had two good articles on original oil cloths back in the 1980s. The original cloths were made using heavy linen cloth normally seen as sail cloth. The cloth was stretched on a frame. Then then took hide gelatin and worked that into the cloth with big squeegees. After that dried they would start with the boiled linseed oil with iron oxide pigment added. Two coats with a good drying time between coats. It gets heavy and really stinky for awhile. I did enough for a haversack as a historical experiment.